1. Rinse quinoa well under cool water in fine sieve or in several changes of water. Drain well. 2. In large pot of boiling salted water set over medium heat, cook quinoa until tender but still firm to bite, about 15 minutes. Its done when germ separates, making it look like a curly Q. 3. Drain well and return quinoa to pot off heat. Cover with tea towel and replace lid, allowing it to steam and producing fluffy quinoa as it cools. 4. 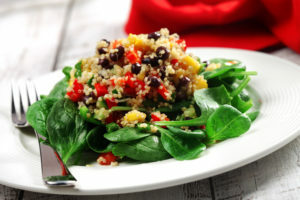 In large bowl, combine cooled quinoa, mango, pepper, spinach, black beans, cucumber and onions. 5. To make dressing, combine canola oil, vinegar, honey, curry and cumin in jar or small bowl and shake or whisk to blend. 6. Drizzle salad with dressing and toss until well coated. Recipe and image courtesy of CanolaInfo.org.